Jobsite completes its fifth season of daring and innovative programming with a core idea the company was founded on – Original Works. 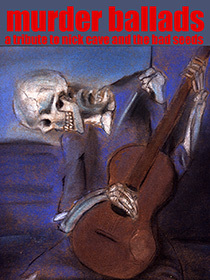 This time Jobsite uses a rock concept album by Nick Cave and the Bad Seeds – Murder Ballads– as a launching pad to pay homage to an underground rock icon. The ten tracks on the album will be represented in some form or another throughout the evening. One track is being used as inspiration for local visual artists to submit gallery pieces to. Another will be represented as a dance piece. Live music, monologue, short plays and film – this evening will truly be a multi-media experience. Chris Holcom and David M. Jenkins have coordinated efforts to create this production with an ensemble cast. Other pieces include a chilling monologue written and performed by Katrina Stevenson, a short play written by Christen Petitt Hailey and featuring Leah LoSchiavo and Matt Lunsford, a short comedy by Neil Gobioff and Shawn Paonessa, live music and arrangements of some of Cave’s songs by Kevin Spooner and two ensemble pieces co-directed by Holcom and Jenkins.